This lesser-known Hans Christian Andersen story is also known as The Steadfast Tin Soldier. The table on which the tin soldiers stood, was covered with other playthings, but the most attractive to the eye was a pretty little paper castle. Through the small windows the rooms could be seen. In front of the castle a number of little trees surrounded a piece of looking-glass, which was intended to represent a transparent lake. Swans, made of wax, swam on the lake, and were reflected in it. All this was very pretty, but the prettiest of all was a tiny little lady, who stood at the open door of the castle; she, also, was made of paper, and she wore a dress of clear muslin, with a narrow blue ribbon over her shoulders just like a scarf. In front of these was fixed a glittering tinsel rose, as large as her whole face. The little lady was a dancer, and she stretched out both her arms, and raised one of her legs so high, that the tin soldier could not see it at all, and he thought that she, like himself, had only one leg. "That is the wife for me," he thought; "but she is too grand, and lives in a castle, while I have only a box to live in, five-and-twenty of us altogether, that is no place for her. Still I must try and make her acquaintance." Then he laid himself at full length on the table behind a snuff-box that stood upon it, so that he could peep at the little delicate lady, who continued to stand on one leg without losing her balance. When evening came, the other tin soldiers were all placed in the box, and the people of the house went to bed. Then the playthings began to have their own games together, to pay visits, to have sham fights, and to give balls. 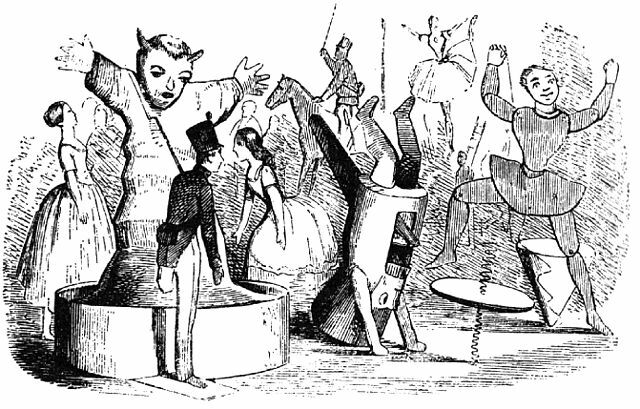 The tin soldiers rattled in their box; they wanted to get out and join the amusements, but they could not open the lid. The nut-crackers played at leap-frog, and the pencil jumped about the table. There was such a noise that the canary woke up and began to talk, and in poetry too. Only the tin soldier and the dancer remained in their places. She stood on tiptoe, with her legs stretched out, as firmly as he did on his one leg. He never took his eyes from her for even a moment. The clock struck twelve, and, with a bounce, up sprang the lid of the snuff-box; but, instead of snuff, there jumped up a little black goblin; for the snuff-box was a toy puzzle. "Tin soldier," said the goblin, "don't wish for what does not belong to you. When the children came in the next morning, they placed the tin soldier in the window. Now, whether it was the goblin who did it, or the draught, is not known, but the window flew open, and out fell the tin soldier, heels over head, from the third story, into the street beneath. It was a terrible fall; for he came head downwards, his helmet and his bayonet stuck in between the flagstones, and his one leg up in the air. The servant maid and the little boy went down stairs directly to look for him; but he was nowhere to be seen, although once they nearly trod upon him. If he had called out, "Here I am," it would have been all right, but he was too proud to cry out for help while he wore a uniform. Presently it began to rain, and the drops fell faster and faster, till there was a heavy shower. When it was over, two boys happened to pass by, and one of them said, "Look, there is a tin soldier. He ought to have a boat to sail in." So they made a boat out of a newspaper, and placed the tin soldier in it, and sent him sailing down the gutter, while the two boys ran by the side of it, and clapped their hands. Good gracious, what large waves arose in that gutter! and how fast the stream rolled on! for the rain had been very heavy. The paper boat rocked up and down, and turned itself round sometimes so quickly that the tin soldier trembled; yet he remained firm; his countenance did not change; he looked straight before him, and shouldered his musket. Suddenly the boat shot under a bridge which formed a part of a drain, and then it was as dark as the tin soldier's box. Add The Brave Tin Soldier to your own personal library.